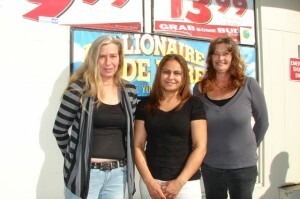 Mary Booker, left, who sold the winning ticket, with store owner Sara Atwal, center, and employee Vicki Thomason. Easy money has its price. It’s an old lesson being learned anew by employees at 1-Stop, the little corner convenience store in Paso Robles where Charles Hairston purchased his $78 million lottery ticket. The 82-year-old Korean War vet bought the golden ducat Nov. 1 and learned later that same night that he had won. But he did not come forward until 18 days later, and during that time, said Mary Booker, the employee who sold the ticket, things around the store changed. A lot. Because of the uncertainty created by the lack of a clear-cut winner, people began hanging out around the establishment, doing some dumpster diving, even checking out neighbors’ trash cans. Others would enter the store and poke through the merchandise, on the off chance that the winning ticket would be tucked between the peanut butter and the Pampers. Booker, with a sigh of resignation, said that many people started to ask a lot of questions that she believes were personal: “Are you rich now? How much will you get? When do you get paid?” Everybody, it seemed, had a question. Owners of the store, Paul and Sara Atwal, will get $390,000, according to lottery officials, and plan to share with their employees. Booker said people would try to trick her into revealing the name of the winner, often “by pretending that they already knew” the person’s identity. No, she said, there has been no payment yet. She doesn’t know when that will happen. And asked if she remembers to whom she sold the ticket, Booker just smiles. Subjects: California State Lottery Paso Robles Profit! It wasn’t the lottery ticket that created the havoc. It was the GREED of PEOPLE. Shameful and outrageous, another reason to put an end to the lottery that was created to help the schools not make millionaires and hysterical behavior. I get it, Great Spirit. Earlier this month, for no apparent reason, I started thinking about a news event from 2006, about a 19-year old who lived in my neighborhood. Thankful I am that I did not grow up in his household, for in certain respects, the cards were stacked against him from the start. Though his mother is a good and loving mother, he grew up in a one-parent household, and the family, like many, many families was cursed with addiction. Whether you believe that addiction is a matter of choice, or a matter of biology, it had its affect on this young man. One day, after drinking a large quantity of hard liquor with a relative, he went outside with an unloaded, antique rifle and began breaking car windows, and somebody called the sheriffs. Two sheriffs came out and told him to drop his weapon (or raise his hands, I don’t know which,) but when he started to raise his hands, he was still holding the unloaded, antique rifle. So, the sheriffs shot him in the chest, neck and head. The video from the sheriffs’ squad car captured this, and it was later shown on the news because considerable public interest centered around whether he actually posed a threat to the officers, who did not appear fearful enough to take cover behind any protective barrier. The video shows him smiling as he seemed to raise the rifle in an almost off-hand way. Anyhow, what happened, did happen, and the flurry of news subsided, and the last we heard was that Chad Allen Berryhill was charged with one or more felonies, including attempted murder of a police officer, and that was it. Right after it happened, I spoke with his mother and grandmother who were grieving but in a way that was almost a denial of their grief and anger. Because we all know how conservative this place is, on the surface, and nobody likes getting their car windows broken out by some drunk teenager with a rifle….So, because of the kid’s vandalism-whether he was conscious or not of what he was doing-there was little sympathy and a lot of condemnation from the pious, and his mother and grandmother were given notice to quit their rental. When I spoke with them, the grandmother immediately took on the responsibility for what had happened because she admitted that she was addicted to alcolhol. And so, they had been drinking together. And though she was sitting in a chair before me, she was somewhere else. And her eyes were still seeing what had happened, and it was hard for her to give words to what she was then going through. His mother admitted almost immediately that she had an addiction to the drug we all hear about which is so poisonous, you wonder how in God’s good name anyone would want to put that stuff in their body. She too, was taking on guilt; taking on the responsibility of what happened. She was feeling so guilty, that she could not stop talking about how wrong they were, and how the community was right to condemn her and her son and his grandmother. But what was so odd, is how considerate she was being of everyone else but what had happened to her son–guilty or not guilty, in the eyes of The Law. She had pushed her anguish deep down inside her. She denied all the rage of a mother who agonizes for her son regardless of his momentary choices which could end in disaster, as it did that day. I expressed my sympathy in any event, and extricated myself from the situation. Then, I forgot about it until now. It started at the beginning of the month. I must have been going through saved newspaper articles, but something reminded me of the events which had taken place in my neighborhood. I decided to surf the Net to find out what had happened to Berryhill. How had his trial gone? Had he recovered from his injuries? What would his family be doing now? In a paragraph from a Tribune obituary, I learned only that Chad Allen Berryhill had passed away at the age of 23 on November 3, 2010. The Buddhists have a saying that “all life is suffering,” and that we suffer because we can never keep things the way we want them, indefinitely. That is because life is change. And so, Mr. Berryhill was born, loved, made imperfect choices like the rest of us, and left this life sooner than he deserved. Because Mr. Berryhill went through what he did, the County Coronor’s Office decided to do an autopsy on him to determine the cause of death. I have no doubt they were seeing spirits of their own, in the form of a civil lawsuit coming down the pike, as it would be natural to ask whether Mr. Berryhill would still be alive if he hadn’t been shot in head, neck and chest. The results of the autopsy were never reported, so I pulled up his death certificate in the DMF. Over a year later, the cause of death was “still pending.” What were they waiting for? A call from the Spirit World? Well, the call seems to have been misrouted. When bringing a lawsuit against a police officer for excessive use of force, or anything he does, even a claim of wrongful death under U.S.C. Sec. 1983, the claim must be brought within a year, or you lose your right to have the matter litigated. Certain statutes will stop the ticking on the clock, so to speak, as when the agency avoids reaching a conclusion as to cause of death. It appears the County is waiting for the clock to run out on the statute of limitations. So. As I sit in my cozy home, and thank the Cosmos that I have made it through another year with the gentle little creatures of the earth who have made it through with me, I am saying my goodbye to Chad Allen Berryhill who was not all bad, and not all wrong, but mostly unlucky and sorely missed by his family. The moon sits like a pearl in cashmere for you too, Mr. Berryhill. Rest in peace. I feel sorry for Berryhill. I don’t praise the Sheriff Deputies. It is just is what it is, its tragic and sad. Berryhill at least found his exit from all of this. It sounds like he was damned doing or not. I think, that two of the most important things common in all good religion is 1. Don’t judge, 2. Treat others as you would like to be treated. I can say that at one time I was a bad or rough person, I can go as far as saying I was worst than the badest of the worst you could ever meet. But we “all” at one time or another were the same in some degree. Funny, people try to get a visual look on what a bad person looks like, sometimes we say its attitude or mental but you can’t really tell by looks. The fact of the matter is, we are all no different, we (good bad, rich or poor) have threshhold, breaking points, buttons or simply circumstantial disposition being like a leaf that fell into the wrong place, regardless of how one looks or appears. Oppression, brutality, arrogance or mistreatment in life can cause hate and make even a rational person become a terrorist or appear like a foolish criminal. I will admit, I have strong pet peeves and low tolerances for people like Kelly Gearhart, Jean Cross, and people snooping into my lottery winnings (if I won)! Thank-you for your response, Willie. I agree with you; truer words were never spoken when you said “Oppression, brutality, ignorance or mistreatment in life can cause hate and make even a rational person…appear like a foolish criminal.” Wisdom comes with experience. As to Ted Slanders’ comments: Does no one recognize satire? Irony? Look beyond the obvious… good advice always. Slanders is no troll… there really is a goal. I hope that people who felt they needed to scour the shelves looking for the ticket, were also considerate enough to put things back the way they found them. I don’t think I’m going to hold my breath on that hope . . .
1) “Havoc” in the headline seems like a strong word for the doin’s begat by the lotto ticket. 2) Slanders is a troll. Feeding his ego by acknowledging his existence will only keep him around. Stroke his ego if you want; but the smart money is on leaving him alone til he gets bored and moves on. At least we know that the women pictured in this news story all have “long hair’, therefore, showing respect to God’s edict as described in 1 Corinthians 11:13-15. I might add that they’re beautiful Sisters of Eve as well! As I have proffered in another thread, these women, if in fact they’re Christians, should also be giving away their newly founded wealth along with Mr. Hairston for the godly reasons in the thread below. You must admit, that the bible laws, commands, precepts, and edicts, are triggered in so many ways in our daily affairs. It’s at this point if the true Christian actually follows them as the Christian God intended. Very well said, TacomaRose. I’ve committed not to reply or respond to the troll’s posts. Perhaps if we all simply ignore the troll, he will slither away quietly. Yea, that’s the American thing to do. Gag minority voices. My, How “Christian” of you ! I don’t follow this particular brand of theologic sophistry, but TS has all of the verses down pat. . If one does not believe what is written in the Bible…well then, you have nothing to fear. If you say that you DO believe it, then you have different – personal – fish to fry. Myself … I think that if God had wanted Man to have Money, then he would have created a Money tree. I just saw a photograph of an image of Jesus on the back end of a dog. Pretty convincing …at least more so than some stupid fried tortilla ! Maybe it’s just God’s way of expressing humor ? The love of money is global now, everything in the world evolves around money. Charity orgainzation exploits most of the donations. Politicians loves to mis-spend “”other people’s”” money. So Mr. Sanders who should everyone write the check to? Subjectively, write the check to your local discount food mart, and then take the food supplies directly to your local homeless shelter. In this way, at least you know that the food will be used in one way or another. Donate your organs upon your demise. What better way to help your fellow earthly passenger that this admirable accomplishment? Give gift cards from Home Depot, and other establishments in the building supply business, to organizations like “Habitat for Humanity”, and other organizations in the same vein, that build structures for the poverty stricken areas of our cities. Go to a store like Costco and purchase a huge amount of animal food, then take it directly to one of the many animal shelters around our area. I am sure that Jesus would be smiling if you did these things, especially when His whole mission was to help the needy, aka, 99 percenters at this time, including our animal friends that are waiting for a home. In all the cases above, you save the middle man, and you don’t have to worry about where you money actually went when in the form of a check! Think of other venues in the same context as the ones listed above, praise! Thanks for entertaining my question. They are good and prudent thoughts. Thank you Willie. My devout faith allows me to be enlightened in coming up with concepts that I’ve shown. You do not have to be Christian to understand nature, the universe and the cosmos. I respect your religion, hope you respect other “good” religion.